Columbia Police Department (CPD) Investigators with the Special Victim’s Unit (SVU) are searching for a missing 24-year-old female. 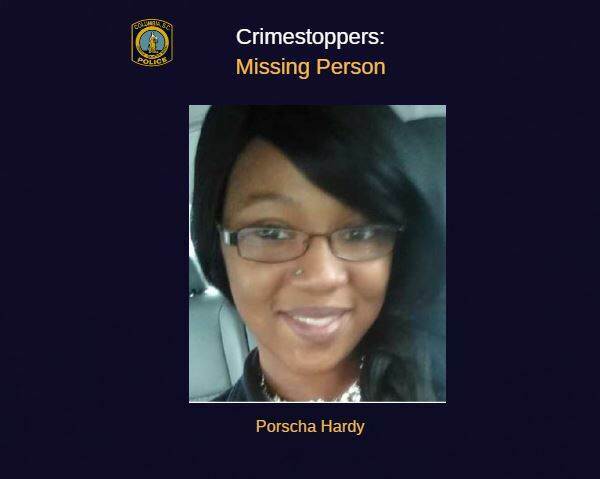 Porscha LeAnn Hardy (DOB: 11-1994) was reported missing on Saturday, December 15, 2018 after she dropped of her child at a local daycare center. Hardy’s relatives tell CPD officers that being away from home is unusual behavior and they are concerned for her well-being and safety. Hardy is described as a black female with black/brown shoulder length hair, is approximately 5’11” and weighs roughly 180 pounds. No clothing description is available. Hardy’s missing information has been entered into the National Crime Information Center (NCIC) database.